Mermaid Bash 5th Birthday Party! Splish Splash It’s A Mermaid Bash! Sofia celebrated her fifth birthday in mermaid style! From the delicious under the sea desserts to the swimmable mermaid wear, this mermaid bash was a hit! The decor was perfect for little girls’ imagination and Sofia even had a beautiful day for an outdoor birthday party! Read more about the details from Sofia’s mom below! Splish Splash It’s a Mermaid Bash! As soon as I saw this mermaid invitation from Tiny Prints I knew it would be the perfect theme for Sofia’s 5th Birthday Party! Plus, who doesn’t love mermaids and splashing around on the beach? The venue was Lake Norman, which provided a beautiful backdrop, and plenty of fun in the sand and water! Guests were greeted with a decorated teepee with garland, a magical bubble station, custom pillows from Shutterfly, colorful lanterns from Pottery Barn Kids, a personalized canvas mermaid sign made at Anders Ruff Workshop and mini pink flamingos from Via Blossom and that lead them down to the beach. Starfish wishes and mermaid kisses! Swimmable mermaid outfits by Mertailor were waiting by the beach for each of the guests. The little mermaids took a break from swimming to enjoy lunch at the magical under the sea kids table and sweet treats from the beautiful dessert table! This kids table had it all from a beautiful blue and white tie dye table linen and tassel table runner to Best Day Ever plates and colorful tumblers from Pottery Barn Kids. Mix and match china isn’t just for adults! We mixed Pottery Barn Kids Best Day Ever Plates with Meri Meri foil mermaid plates and napkins. These custom lucite and agate stone napkin rings by Set in Stone, added the finishing touch of this under the sea tablescape! Kids lunch included chicken nuggets from Chick Fil-A, gold fish, and watermelon starfish! However, the dessert table stole the show with the beautiful custom backdrop and sweet treats! The commissioned mermaid painting from Art House Charlotte, by artist Lauren Reddick, is even more stunning in person and was the focal point of the backdrop with custom DIY balloon garland, from One Stylish Party, that looked like bubbles of the sea! One of my favorite party décor items that also doubles as home décor is the turquoise octopus chandelier from Chandelier By NK, which adds a whimsical feel to the party! The main dessert is this one of kind mermaid cake from Edible Art Charlotte, combining two popular styles of waves at the bottom and mermaid scales at the top in ombre, with a mermaid and seahorses on the side. Kids also enjoyed ombre almond pound cake shooters with mermaid tails, chocolate covered pearls, and custom mermaid tail, fish, seahorse, and sea shell cookies from Kessa Cakes! In addition to swimming, playing in the sand, and a bubble station there was a mermaid kit station, where each guest had the opportunity to design their own mermaid from precut mermaid tails, hair, and accessories. All guests received mermaid starfish sunglasses and mermaid bracelets for the party favors, which was in addition to bubbles and a mermaid tail cookie to take home. LOVE it so much… So happy that our new workshop could help make some pillows and the mermaid canvas for her! AR workshop loves Pizzazzerie, too! LOVE YALL! Got that typo fixed too (ack! sorry!). xoxo! Love all the details! 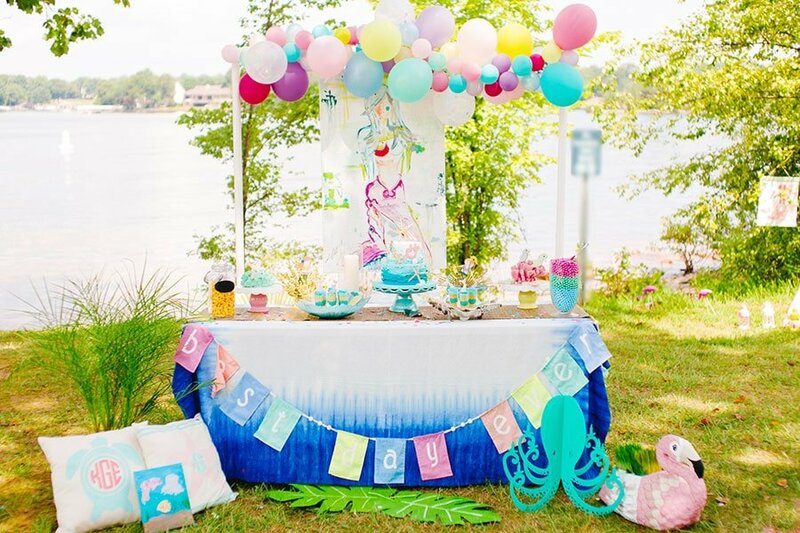 Can’t wait to plan my daughter’s mermaid party this summer! Cute art too!